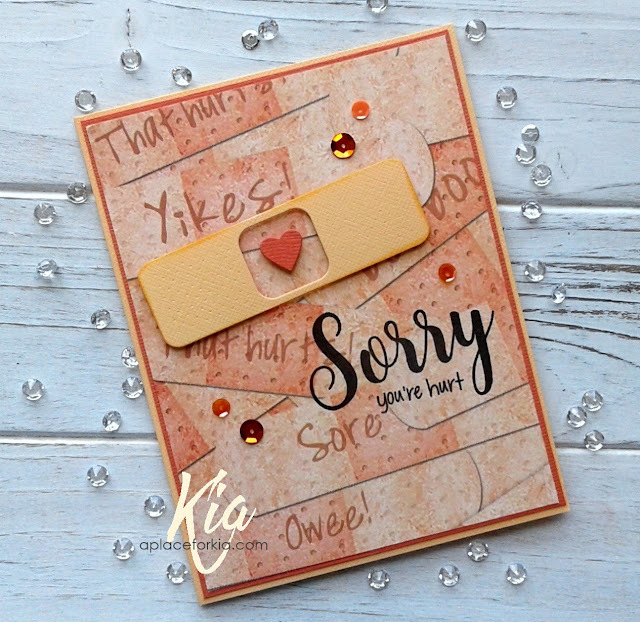 Oops, sorry you're hurt, is a card I did for Frantic Stamper and failed to upload. I love the band-aide, very simple but effective. The background paper I have had in my stash for years, so it was nice to be able to use it for this card. The band-aide is on foam strips and die cut from cardstock, with acetate in the centre along with the die cut heart. I stamped the sentiment in black and added a few sequins to finish. A great card to have in my stash ready for the time that I will need it. Thanks for having a look today. Products: Frantic Stamper Adhesive Band-aide, Frantic Stamper Sorry Stamp Set, Unknown Designer Paper, Bazzill Cardstock, Neenah Cardstock, Acetate, Sequins, Foam Tape. The band-aid is super cool, just the color combo.